Join the Kingdom of Gamer Now! Thank you for purchasing HIS product. At HIS, we always strive for best ways to serve you. You can now join the incredible HIS army to conquer the gamer world! 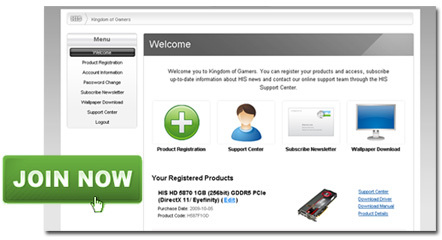 However, before you immerse into the surreal gaming experience, don't forget to register your HIS product. On line Technical Support is your online based help center and contact information center to our Technical Support Team. When you purchase a HIS product and we wish to provide you with adequate support so you can enjoy our products. To receive support please visit ATI Customer Care for extensive online support, including Drivers, Manual and Knowledgebase. For general requests, you may quick get your answers by following links. To prevent any support delays, please be sure to select the correct region or Country. If you are unable to resolve your support issues by the link above, please do not hesitate to fill in the following Technical Support form. Please enter your product Serial Number and then click Submit. Our support staff will look into your problem and reply as soon as possible. How to locate the Product Code & Serial Number of HIS Graphics Card ?